Production is truly moving forward now! So far we have three colorways! Each of these colorways are *rare* colorways. As in 5 or fewer of each were produced. We found a cool way to denote rarity for our caps, by using the synths indent we can denote rarity with a certain color Resin, in this case gold Resin! We are excited to continue producing Spooders for the upcoming sale! Moving forward with the spooder sale! The Spooder will be MX for this sale do to some issues with our implementation of a TMX insert. So far we have one Single cap mold and another Three cap mold to aid in production. From this we now have 8 masters made. The plan is to make a few more molds and then roll into full production of the cap! We are very very excited to start making some colorways for Spooder! Check back here for more updates! I had to go the nuclear option and brought my HHKB into the keyboard ER to remove this failed stem😬 . That was yesterday. Today I had the smaller stem in my hand while watching one punch man and I don't want it to go to waste so I decide let's sand it down and see what happens, it actually worked! Here are a few picks of the fit. Very snug on mx, I can shake it by the stem and the switch doesn't fall out. I'm very excited to get this into a spooder to see the fit on a board. I'll be sure to update everyone when I get it working! In the mean time I picked up so super sculpy firm after some advice and decided to start work on the next Keymaker cap! The final design will stay under wraps for a while but I'm very excited with its progress so far! Not much news beyond that sadly, real work has been eating up some real time. Tomorrow we will have news on how the TMX stems have come out and hopefully begin Spooder production in earnest. So last night I designed some 3D models of a potential cherry profile gamer kit! I sat there with my calipers and gingerly measured some GMK 9009 caps to get as close a profile as I could in Fusion 360. there are three distinct caps each with a profile similar to rows 1, 2, and 3 of cherry caps. I made some renders to show what the shapeways 3D print should come out like! These keys are very very similar in profile to cherry caps save for the three cutout in each to give the cap a deep textured feel. The caps are slightly scooped so in addition to the groves there is the familiar curve of cherry caps. The caps are being printed with shapeways frosted extreme detail option to get as much detail as possible. When they arrive they will be sanded and I will create silicon molds. From there I should be able to make gamer kits, MOBA and FPS, a regular appearance on the Keymaker.Space store! In other news I finally got shipping notification and tracking information on the TMX stems! Today we are starting a new blog that will keep anyone who wants to know updated with the latest information about our crafting activities! Hopefully we can include some great pictures of the process we go through designing, sculpting, and producing our keycaps. We want this to create a sense of connection and excitement for what we add to the artisan community! Currently we have refined our Spooder design to its final form and are quite happy with the texture, dimensions and makeup of this cute little Spooder. 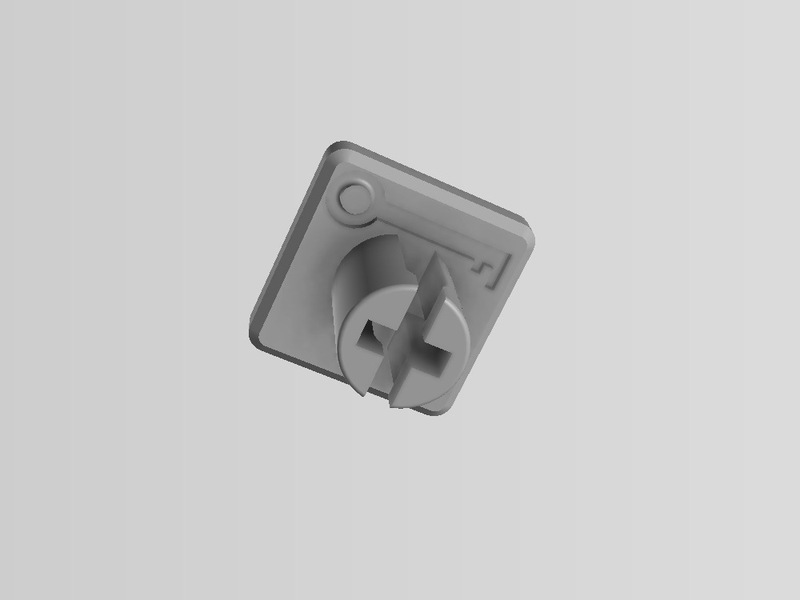 Now that we have the final design we would normally be moving into production by creating multi-cap molds to speed the creation of more Spooders. However we are waiting on something new we designed and are very excited to try out! TMX stems are something we have been very eager to try for some time. We designed and have printed via shapeways some test stems. These stems are being printed right now and are scheduled to arrive before the end of the month! If all goes well we will be making these stems the norm for our designs going forward. The stems themselves will be Resin cast from the 3D master which will allow us to produce many and in a variety of colors moving forward. These TMX stems also serve a double purpose! Besides allowing our caps to work with Topre boards, the maker mark 'key' will be used to signify rarity! The key will be infilled with a consistent color Resin across all future sales that will be used to distinguish the rarity of the colorway! Thanks for checking out our update, we hope to be able to bring these to you on a regular basis so stay tuned!